The Storm - Hi, friend Climate and Weather Information, in this article entitled The Storm, we have prepared this article well and concise to be easy to understand for you to read and can be taken inside information. hopefully the contents of the post that we write this you can understand and useful. okay, happy reading. Its here.... A beautiful looking storm in the infrared and water vapor satellite imagery (first and second images below). The dark color in the water vapor satellite imagery indicates dry air descending into the low, a sign of strength. Here is a the short-term forecast for 11 PM tonight...an impressive 966 mb low! There are a lot of isobars and very large pressure variations that produce strong winds over the Pacific Ocean. As forecast the winds have really accelerated offshore and along the coast, with sustained 30-40 mph, with gusts of 50-60 mph. 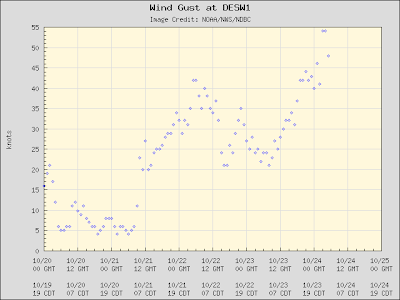 Here are the maximum gusts at Destruction Island...right off the WA coast...gust to 54 kts-- 62 mph. Lots of wind gusts above 50 mph over the ocean. The waves are increasing rapidly...now approaching 20 ft seas offshore--and they will rise further. The Smith Is reporting station died, but here is from buoy 48088 at the eastern entrance to the Strait of Juan de Fuca. 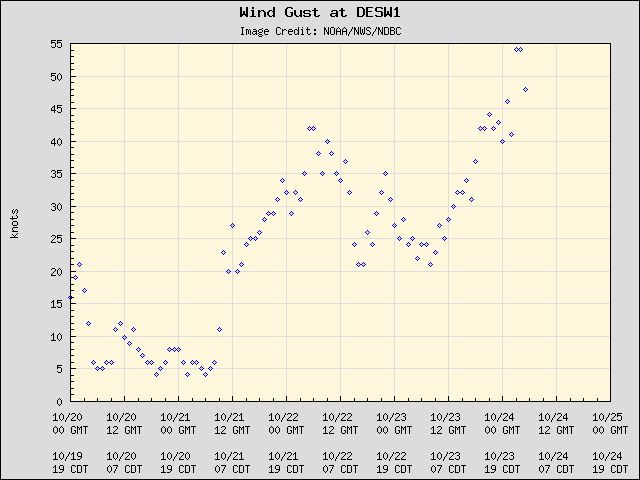 Peak gusts are at 35 kts and rising. 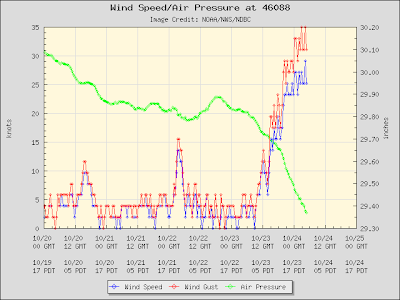 But this is NOT going to be a major wind event in Seattle...even though some TV stations (unnamed ) are talking about it. And of course it is WET outside,with steady rain over the region...here is the latest radar--green is moderate rain, yellow is heavy. A very nice rainshadow NE of the Olympics. The heavy rain should be done by sunrise, with showers tomorrow. Computer models are having a hard time deciding where the low is going--we will see. Thank You and Good article The Storm this time, hopefully can benefit for you all. see you in other article postings.